We never signed up to be taunted by our dreams - to be teased for all that hasn't happened yet. Peeking out from the covers each morning wondering if this day we will fail just like we have in the long succession of days before. Or maybe, just maybe, today we will be someone great. The kind of someone we crave to be. We haven't been enough yet. Or maybe we go into the world with our shiny new shoes, but the world doesn't seem to want us. Our freshly unpacked visions and breathtaking ideas - no one has time to see our beauty. So we pack up, go home and crawl into our beds. Under the sheets we go where it is safe and we await the coming of another morning. This isn't what we signed up for when we decided we wanted to be dreamers, doers and original gangsters. We didn't expect to lose or be broken down. We never expected to stop fighting. Each day we dull down our dreams to soften the blow of life. Each day we expect a little less because we can't stomach the thought of coming up empty again. We sell our dreams for the comfort of our sheets. Where we hide and wait for something to change. The thing is, I don't want to be a timid dreamer anymore. I don't want to stay here in this muted world I've created for myself. I want to break out, have brawls with doubt and lay back with my bloodied nose knowing that I didn't surrender. I didn't quit. I fought and I got free. I'm ditching this joint and I'm inviting you to come. Remember how good cold rain felt on your face as a kid - when you weren't worried about it ruining your makeup or your suit? The smell of honeysuckle in the summer and excitement of a new box of crayons? Remember when you expected to make beautiful things? Dreaming of seeing the world - the actual world - instead of just pinning it on your Pinterest board? Life will have it's hard days, and sand will be thrown in your face by people who don't believe in you enough. Some circumstances won't change no matter how hard you yell and push on them. But those are the places we simply pass through, not where we have to remain. 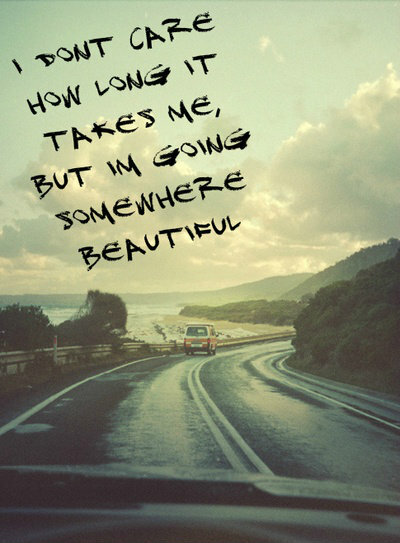 Let's head somewhere beautiful again. To a place where we work hard and make things happen. Where we sit with neighbors on front porches and connect to humanity. Where dreaming makes us smile at the possibility instead of cringe at the defeat. It may take us awhile to get out of our habits. To crawl out of our beds that we have come to seek comfort from at the start of every morning. We will trip over our own feet more often than we'd like. But, we will get there. I don't care how long it takes us. Let's go somewhere beautiful again.